You may not have grains in your garden like I talked about in my last post, and you may not be ready to build a solar food dryer that I talked about in the post before that. 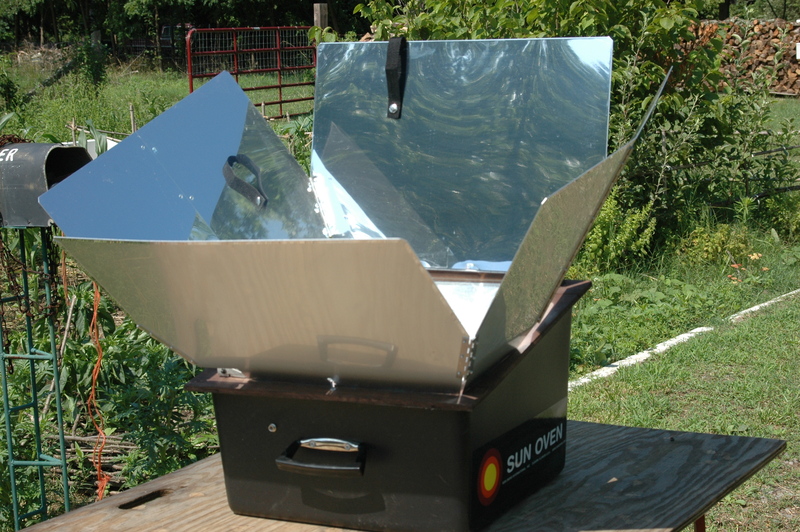 Solar cooking, however, should be possible for almost everyone, unless you really do live with a cloud cover every day. 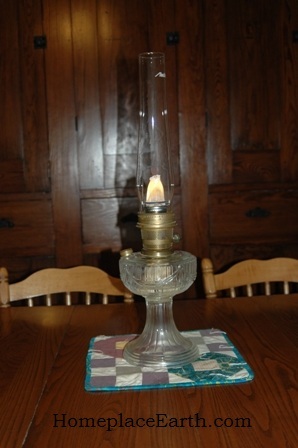 I have been playing around with solar cooking for several years, learning a bit each year. Now I’m ready for more commitment. There are plenty of designs for solar cookers to choose from. All you need is some cardboard and aluminum foil and you’re almost there. Well, it’s not quite that easy. I thought about it a long time before I took any action. My life was already overflowing with projects and each project takes time and attention. Learning to cook with the sun is no exception. I finally bought a CooKit from Bountiful Gardens. It is cardboard with foil covering one side. You put your container of food in the plastic bag that comes with it, but you can use any oven cooking bag. I never liked using the plastic bag and this year came up with a terrific solution. I am using the top to a glass cake saver. It works great! Because I didn’t like to fold and unfold the CooKit and I didn’t like the plastic bag, I made a solar box oven from two boxes with newspaper insulation in between. That was a project I started one day with my grandson, thinking it would be something fun to do for the morning. He quickly lost interest and I worked on making that thing ALL day. I never had as much success with it as I thought I would. The slightest breeze would bring down the lid that was held up by a rod cut from a clothes hanger. I would frequently lose that rod and have to make another one. But it worked well enough for me to know that if I made some refinements, such as adding more reflectors and securing that rod, things could be better. In the end, though, I would still have a cardboard box that needed to be brought in each day since we have such heavy dew at night. To really make solar cooking a part of my life, I needed a weatherproof solar oven that I could leave outside all the time. I learned a lot from these two solar cookers. Most importantly I learned that, although they can be left unattended for long periods of time, they work best if you can adjust their position at least every hour to follow the sun. If it is windy, the flap on the box oven might close or the CooKit might be repositioned. Clouds might move in and cool things quickly. The best time to cook means that dinner is ready before we’re ready to eat it. Last summer I had the opportunity to borrow a Global Sun Oven for a couple of months. It worked well, although I would have liked it to be bigger. Since I had borrowed it, I brought it up to the porch each night to protect the finish. 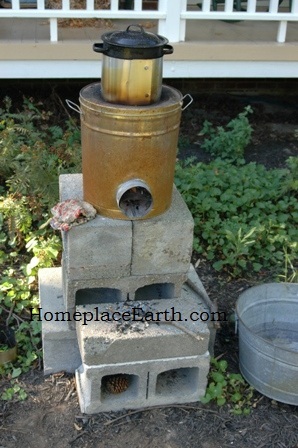 It worked so well, I bought one when I visited Lehman’s Hardware in May. 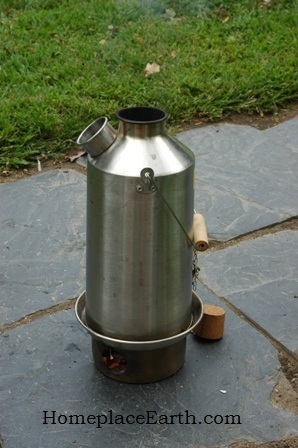 I believe I have used that more in the past seven weeks than all my solar cooking efforts in the past several years. I fold the reflectors in when I’m not using it, but if I’m using it day-to-day, I leave it outside. If the weather is threatening or I know it won’t be used the next day, I’ll bring it onto the porch. I still would like to build a larger solar oven on its own swivel, so just a tap will turn it with the sun, but I knew I didn’t have time to do that this summer. I have cooked quiche, brownies, rice, potatoes, polenta, meatloaf, and melted cheese sandwiches. I hardcook eggs, brew tea, and make applesauce from dried apples. The tomato sauce on my recipe page cooks up well in a solar oven. One thing that may make some people hesitant to get started is the lack of proper cooking vessels. I find I cook a lot in wide-mouth quart canning jars or glass casserole dishes that I already have. 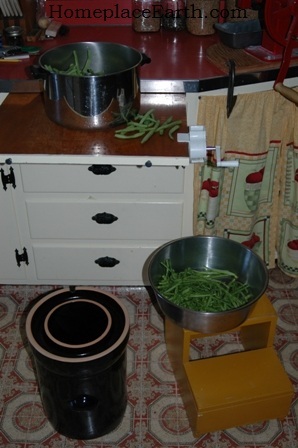 Early in my solar cooking experience I bought a black enamel pot with a lid and a small black enamel roasting pan. I like the jars or casserole dishes because I can see what’s happening. I’ve discovered that the lids on casserole dishes will fit pie plates. When I cooked the quiche, I used a deep dish glass pie plate with a casserole lid on it. I solved the problem of food being done before we we’re ready to eat by putting the dishes in a hotbox once the solar cooker starts to cool, usually around 4pm. 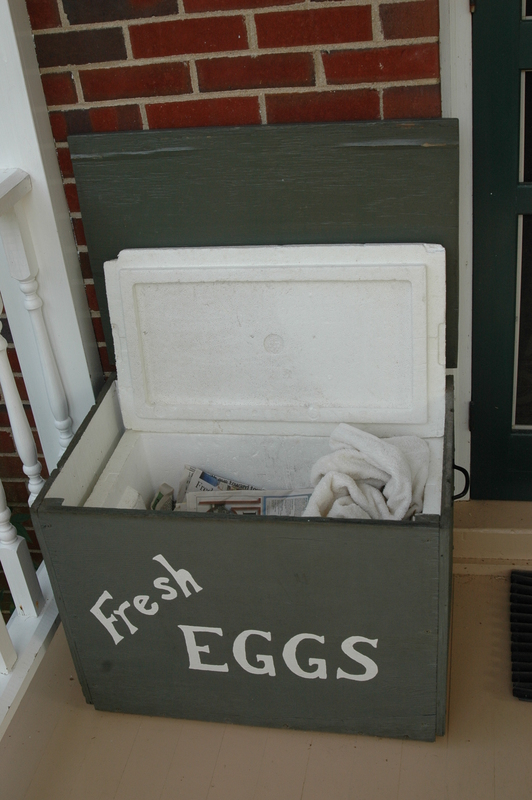 We happen to have an insulated “Fresh Eggs” box on our porch. I made it to fit a styrofoam cooler years ago when I sold eggs. I would leave them in there for my customers to pick up. I have newspaper and a towel to further insulate the hot dishes. Our meal stays hot until we’re ready for it. You could use any large picnic cooler for the same purpose. The most wonderful thing is that the kitchen stays cool on these hot summer days. 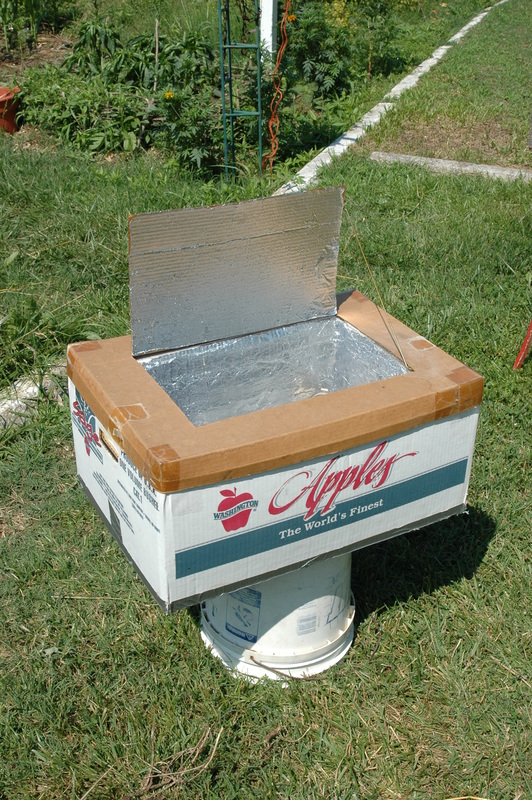 Before you make a major purchase of a solar oven, do some internet research, read some books, and make a solar cooker. Just do it. A good place to go for information is Solar Cookers International. Every new skill you learn is something to build on. It is the learning that’s important and the learning comes from the doing. By cooking with the sun you can save fossil fuel, keep your house cooler, and become more attuned to the natural world around you. I’m really enjoying my new Sun Oven, but now that I’m using the cake saver with the Cookit instead of a plastic bag, I’ll continue to use that, also. I gave my box oven to a friend. 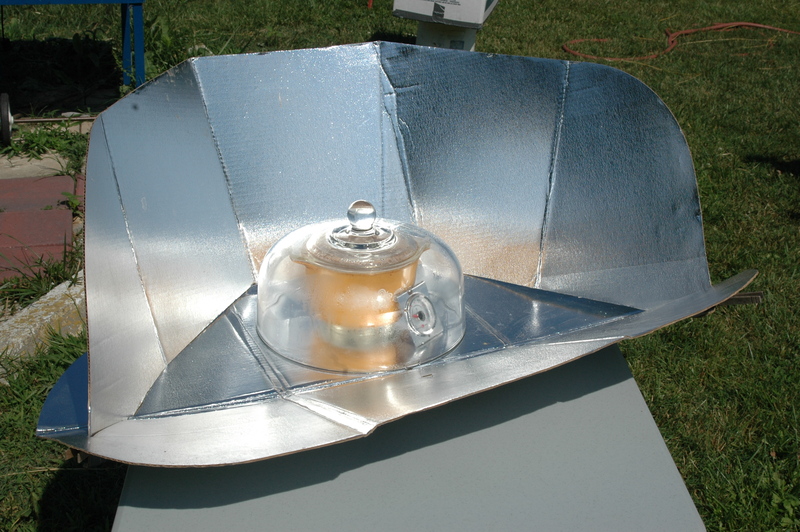 You can make a solar cooker from a car window reflector and a bucket, or so I’m told. There are adventures to be had, so what are you waiting for?